While the photo makes her look quite nice, all of the tones in the boat are neutral. Nothing has real color. The varnish is satin finish. Please also take note of the air conditioning intake and vents in center of salon. When sitting at the bar the air comes down your neck. In addition the air is noisy. 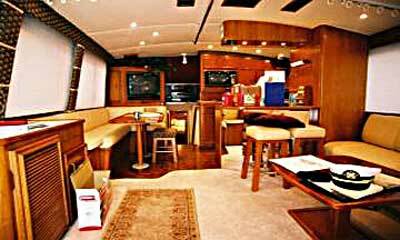 The plan for the floor is to cut the carpet from the right side of the entry door extending to the left side of the bar in a smooth curved line passing the couch and table. The carpet on the left of this line will then be removed. 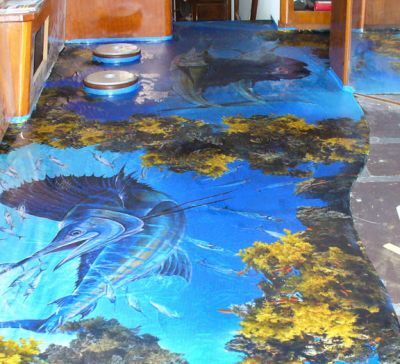 A fabric with some special (undetermined at this time) print will be laid into epoxy for this area and extending into the galley. 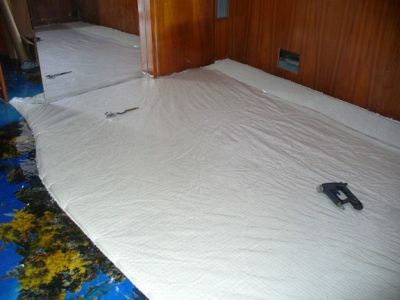 Clear epoxy will then coat the fabric and make our floor. This is a sample of Mark Ray's Art. 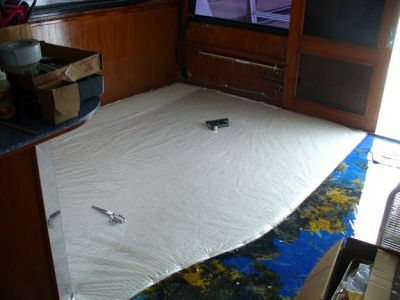 Mark will be creating several things for us including the salon floor, comforters for the Master Stateroom and VIP Stateroom, and the mirror for the main salon. We fell in love with his work. Check out his site and you will too. Watch this artist because he is really going places. This is where the Mark Ray artwork will be installed. 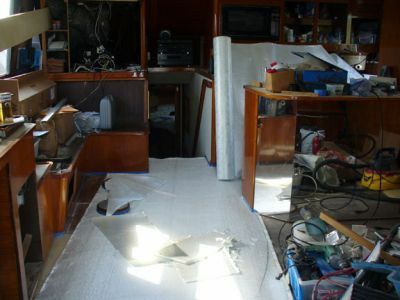 Before fiberglassing, the salon portion of the floor needs to be made flush with the galley and dinett area. 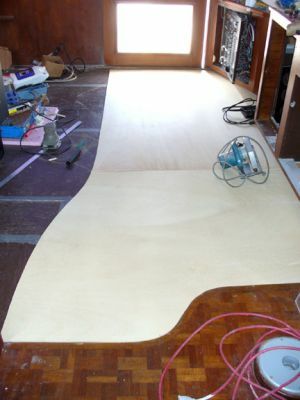 1/4" plywood has been cut to size and will be bonded to the floor area. 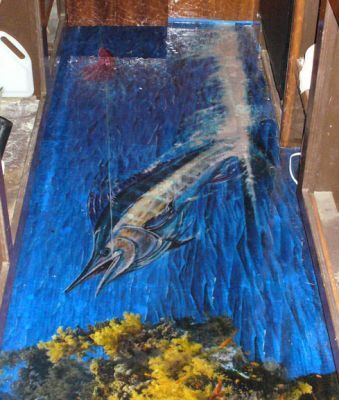 The plywood and Parkay will then be glassed over in preparation to lay cloth with Mark Ray artwork onto it. First the glass was cut to size. Then it was epoxied in place. 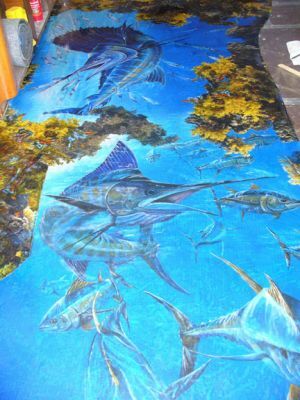 The fabric printed with Mark Ray artwork by Dockside Canvas was cut to size and epoxied onto the floor. Now, several coatings of epoxy will be applied before final coats of urethane finish it off. The epoxy coats will give it depth and the urethane will give it endurance. 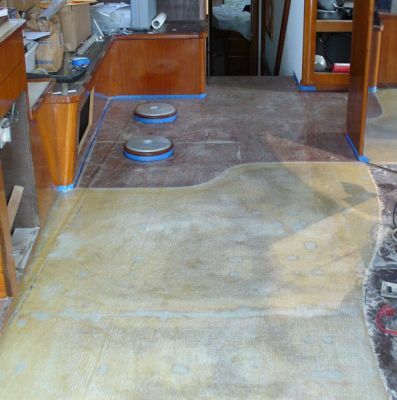 We fitted the carpet and staple stitched it to join the Mark Ray floor. We originally thought we would need to put trim over the seam at the carpet/floor edge but the staples hid so well that it was not needed. 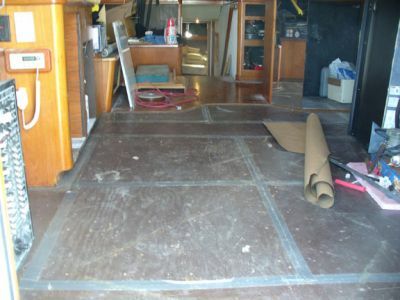 This photo shows how the protective plastic had been placed over the floor. After all work has been completed, the plastic will be removed leaving a very clean mating of the two floor areas. 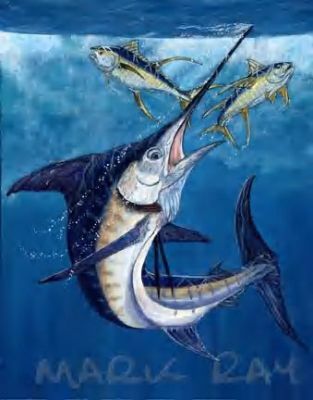 Blue Marlin in the Galley! Guess she was hungry.